Dibble History - Westward, Ho! 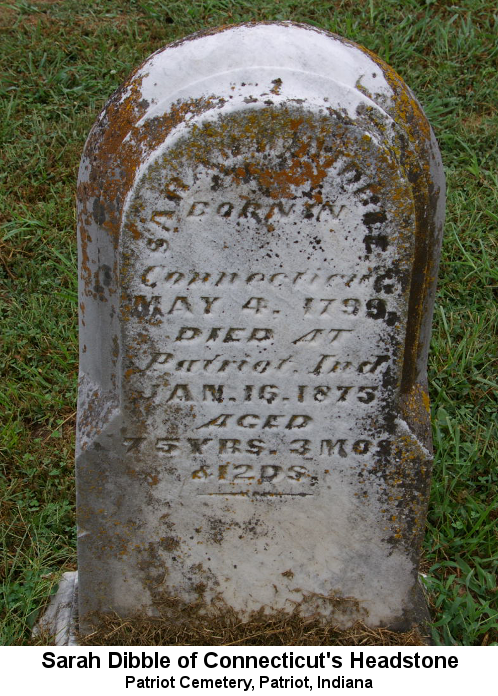 Sometime in the 1830s, John Dibble and his wife Sarah and their children, his brother Jonathan and family, and his brother Samuel's widow Deborah and some of their children, left Connecticut for points west. Eventually, after a no-doubt arduous trip of nearly a thousand miles, they arrived in southeastern Indiana, the area along the Ohio River, just north of Kentucky and some 20 miles southwest of Cinncinati, Ohio. Perhaps they decided to come after hearing their Jessup relatives praise the place. According to Rev. Jesup, two descendants of Thomas "Jessop" went to Indiana Territory in 1812. They lived near Richmond in Wayne County, about 100 miles north of where the Dibbles settled. But Thomas Jessop came to North Carolina from England in 1722, so, of course, this family may not have communicated with the Jessups of Connecticut at all. However, Isaac Jessup, son of Stephen Jessup of New Jersey, who seems to have been related to the Jessups of Southampton, Suffolk County (Long Island), New York, moved to Hamilton County, Ohio (location of Cinncinati) in 1801. At least three of his children "left large families in Switzerland and Ohio Counties" in Indiana. His daughter Abigail married a Mr. Hill and died in Switzerland County. His sons Isaac and Walter were living in Cotton Township by 1820. His daughter Lydia also lived in either Switzerland or Ohio County. And, a William Jessup who was born in Dutchess County in New York in 1797 may have lived in the area between 1819 and 1832. These Jessups might have communicated with relatives in New York and Connecticut. So perhaps John and Jonathan, whose mother was a Jessup, heard good things about the area from that side of the family long before deciding to move there. John and Sarah Dibble, at least, may have come because Sarah's probable parents, Silas and Abigail Howe, were already there, as much as 15 to 20 years earlier. When the Dibbles first arrived, they seem to have settled near Davis' Corner in Posey Township in Switzerland County. Davis' Corner was recogized as a place where people lived as late as the early 20th. century, but today it is impossible to find on any map available on the internet. It's probably just a bit east of the tiny hamlet of Quercus Grove, where someone named Davis had a farm. From there they spread out--to Quercus Grove, east to the river town of Patriot, west into neighboring Cotton Township, and northward to the town of Rising Sun in what was then Dearborn County. In fact, the soil was not virgin at all, nor were "undesirables" from Kentucky its first inhabitants. That honor goes to Native Americans, though of which nationalities we can't be sure. They seem to have left before any white settlers who might have taken an interest in the matter got a chance to ask them who they were. 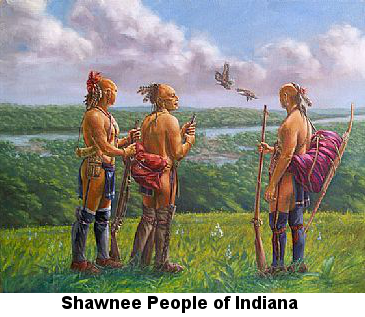 As best we can tell now, there were probably members of the Shawnee, Lenape, and Delaware nations, and perhaps others, along the riverbanks in what is now southeastern Indiana, southwestern Ohio, and northern Kentucky near the end of the 18th. century. There are many "Indian mounds" in the area. Some seem to have had ceremonial purposes, others are clearly the ruins of towns or villages, probably abandoned in the wake of the "Great Dying"--the plagues that decimated the inhabitants of both North and South America soon after first contact with European explorers in the 16th. century. One such mound stands on what was, in the late 19th. century, "the Dibble Farm", two miles south of Patriot. (There were actually several "Dibble Farms" in Switzerland County, and it is not always clear which one is being referred to.) But by the time the Jessups and Dibbles arrived, history had ceased to mention the original inhabitants. Some 15 years earlier, the first white residents of what later became Craig Township, in the southwest corner of Switzerland County, were sufficiently worried about being attacked that they built a blockhouse in 1805 or 1806, "in which to shelter the women and children on an alarm being given of the approach of Indians", though history does not report whether they had anything to be alarmed about. Native Americans did remain active further north and west in Indiana Territory for some time. What made them leave this region when they did? Although the United States and Britain were formally at peace after the Revolution, the British remained concerned to limit the spread of American influence in North America, primarily out of fear of losing Canada but also in the interest of protecting British access to the Mississippi River and the Pacific Northwest. In these endeavors they had many allies among the Native Americans, who wished to retain control of their land. Throughout the final decades of the 18th. century and the first decades of the 19th., the British armed and supplied Native American military organizations, and those groups were frequently at war with the United States. One such war, in which British support played a small role, was the Northwest Indian War. 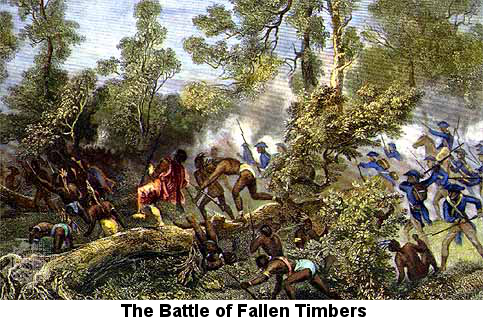 This conflict culminated in the Battle of Fallen Timbers, on the site of present-day Maumee, Ohio, near Toledo. In this battle, the Western Confederacy of over 15 Native American nations was defeated by the army of General "Mad" Anthony Wayne, on August 20, 1794. As a result of this loss, the Western Confederacy signed the Treaty of Greenville in 1795. 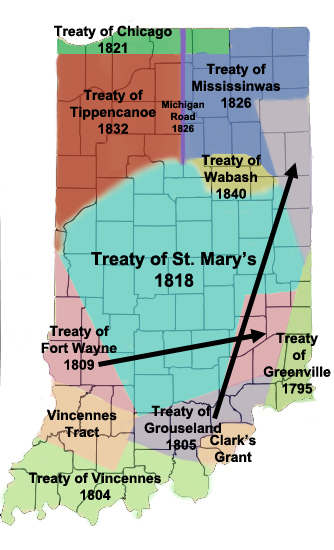 The treaty formally ceded two-thirds of what is now the state of Ohio, and the southeastern corner of what is now Indiana, west of the settlement of Cinncinati, to the United States. At this point, white settlers, "desirable" and "un", began to cross the Ohio River and take up lodging in what became Switzerland County. 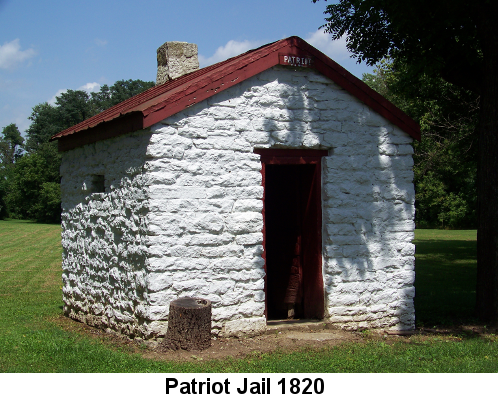 Heathcoat Pickett seems to have been the first white settler in the county; he built a log cabin near Plum Creek about three miles from Vevay in 1795. William Cotton came in 1798 and settled on Indian Creek a few miles up from the Ohio River. He lived in a large sycamore tree before building his cabin. The first named (presumably "desirable") settlers in the area around Patriot were John Hopkins, who arrived in 1801, and Irish immigrant Patrick Donahue, who came in 1804. In 1800 the US Congress passed a law granting the land between Plum and Indian Creeks, in the south-central part of the county, to anyone who wanted to settle there to grow grapes. A group of Swiss farmers learned about this and arrived to secure the grant. They came from Canton Dewaird in Switzerland, whose main city is Vevey. Several important characters in our story arrived in the first two decades of the 19th. century. Reuben Searcy and his sons Lemuel and Moses crossed over the river from Kentucky and settled in Posey Township before 1810. Reuben may have been the first white settler to set down in the uplands (as opposed to along the river or creeks) in the township. His son Lemuel bought a quarter section near the ridge that bears the family name and they moved there in 1814. A "section" was defined by the 1785 federal land act as an area one mile square, containing 640 acres. Lemuel's plot was therefore 160 acres. 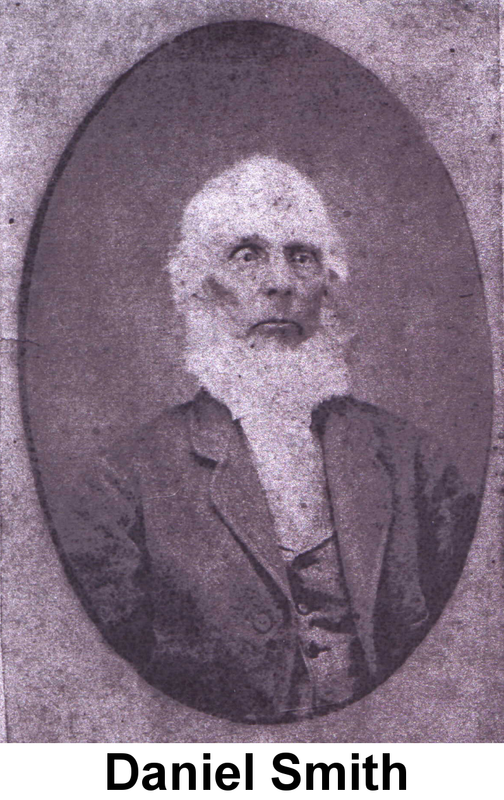 William Searcy, possibly Reuben's brother, was in the county by 1820. Peter Lostutter, son of German immigrants to Pennsylvania, also came from Kentucky. He lived briefly in Dearborn County before settling on the south side of Grant's Creek, the northern boundary of Switzerland County, in 1815. Today the Grant's Creek Baptist Church Cemetery is also known as the Lostutter Cemetery, and many members of the family are buried there. Some of the children of Jacob Abylott Powell arrived before 1820 and settled on both sides of the creek, including in the hamlet of Millersburg, in Randolph Township, a place which can no longer be found on a map (perhaps due to a devastating fire that took place there in the early 20th. century), but which must have been somewhere near Miller Brick Lane, perhaps close to Arnold Creek. The county was initially divided into just two townships: Posey and Cotton. Three more--Ross, Craig, and Jefferson--were added at the first meeting of the county commissioners on February 10, 1817 at the courthouse in Vevay. The house of Elizabeth Searcy was chosen as the polling place for Posey Township at that meeting. 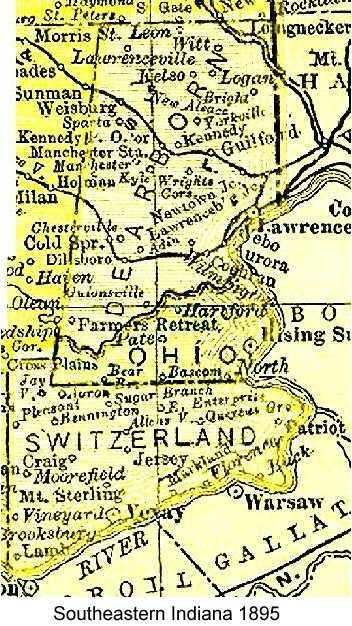 In 1819 the northern portion of Craig Township was separated out as Pleasant Township. In 1822 part of Ross Township was absorbed into Ripley County, and the remainder was added to Pleasant Township. York Township was carved out in 1831. Meanwhile, in 1800, somewhat further up the Ohio River, the Revolutionary War veteran Thomas North had eked out a homestead just above the mouth of Grant's Creek. In 1803 Indiana Territory Governor William Henry Harrison (later famous for being the President with the shortest term in office--30 days) organized an approximately 18-mile wide swath of land, running from a couple miles north of where Interstate 74 is today all the way south to Grant's Creek, including Thomas's farm, as Dearborn County. Harrison named the place after General Henry Dearborn, at that time the Secretary of War under President Thomas Jefferson. Some five or six years later Thomas North's younger brother Lot arrived and set up his own farm. Lot came from Whitestown, New York and, according to family legend, was a drummer boy in the Revolution. The two brothers were descendants of John North of Farmington, CT. Much later, the hamlet of North's Landing, where Lot's grandson Nathan ran a store, bore their name. Dearborn County was broken up in 1845, and the southern region, containing the town of Rising Sun as well as North's Landing, became Ohio County. Two very important families in our story settled in or near Rising Sun. Phillip Eastman was born in 1763 in Ashford, Windham County, CT. Philip's second wife, Mary Ann Eldridge, was born in Rhode Island in 1795. By 1814, the Eastmans had migrated to Portsmouth in Scioto County, Ohio, a town on the Ohio River about 70 miles southeast of Cinncinnati. That is where their daughter, Olive, is said to have been born, on January 11, 1814. Olive may have had a brother Nelson, born in 1817. By 1825, the family was in Rising Sun, where Olive was later remembered as one of the "older scholars" at the Methodist Church school. Philip served as a Justice of the Peace for Randolph Township in 1827, and as a County Commissioner or Magistrate in what was still Dearborn County in 1828. The Smith family also probably came from Connecticut and may have been neighbors of the Dibbles in Stamford. However, one branch of the family had moved to Pine Plains, Dutchess County, NY before the Revolution. Daniel Smith is said to have been born on August 12, 1807, in Dutchess County. His parents may have been Walter Smith (1774-1843) and Sarah Wilbur (1770 - 1851). Daniel Smith may have known Olive Eastman at the Methodist school, though, given the differences in their ages, he probably would have seen her as just a pesky little girl in 1825. 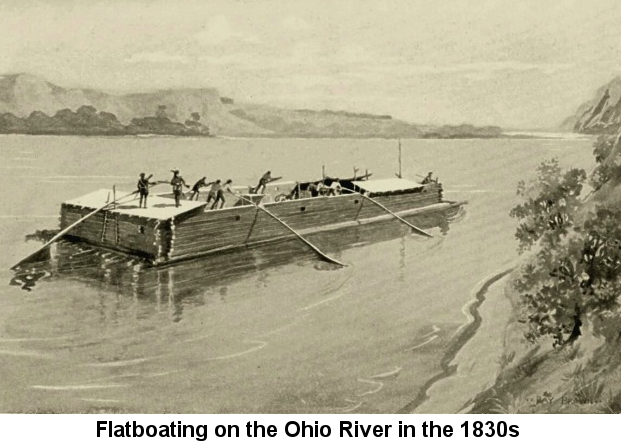 Although steamboats were regularly traveling the Ohio River by the 1830s, flatboating remained popular for decades. No doubt the steam freight charges were high. But steamboats made flatboating more profitable, because the boatmen could sell their boats in the Crescent City, and buy cheap tickets for much faster trips back to the Queen City, Cinncinati, a major destination. They would need a new boat for every trip, but they could count on recouping much of that cost, and they could make more trips and haul more freight in the same amount of time. The village of Patriot was well situated to provide a harbor for this traffic. One of the factors in deciding where to build a river town was the location of the "channel". The Ohio River was broad, but not deep everywhere. Between its banks ran a meandering channel of water deep enough to float heavy boats. You wanted to build your town at a point where the channel came close to the riverbank. Patriot was in such a spot, and the town, though never very large, did well. And it was doing well when John Dibble, his wife Sarah, and their children Silas, Henry J., Charles, George, Alonzo, Sarah Elizabeth, and John W. arrived in 1832. John bought 160 acres in Posey Township and proceeded to farm it. On December 15, 1837, his wife Sarah gave birth to her son Jonathan. Her next--and last--child was born on July 26, 1840. His name was Sylvanus. 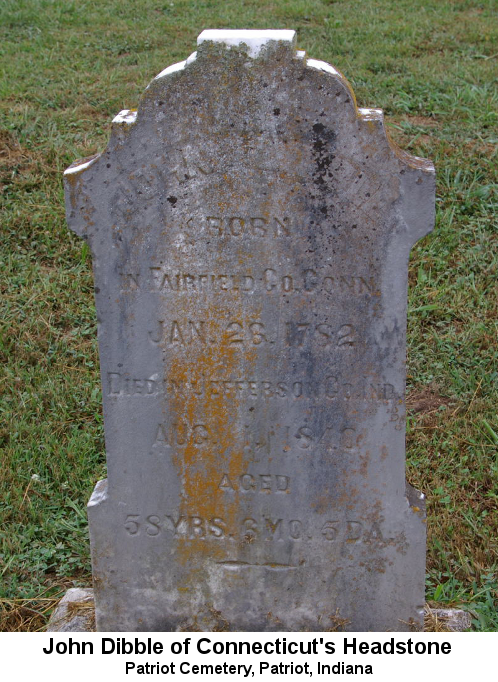 Less than a week later, on August 1, 1840, his father, John, died in "Jefferson, Indiana". When the census enumerator visited John's farm before Sylvanus's birth in 1840, John had 13 people in his household. One presumably was his wife Sarah. Only eight of them may have been John's children, though the two oldest boys, Silas and Henry, were champing at the bit to get out on their own and may have already been gone. If so, John may have had farm hands living with him. Two young females may have been domestics, but there was also a boy between the ages of 5 and 9; none of the unaccounted-for children of John's brothers would have been young enough. All of this could be chalked up either to wrong birthdates for John's children or those of his brothers, or mistakes by the census-taker, but it's a minor mystery. It seems likely that John and Sarah's son Harvey, if there was such a person, died sometime in the mid-to-late 1840s. John's younger brother Jonathan also may have come to Switzerland County with his wife Mary and one or more children, though nothing is known of his activities there. He may have died there, or moved on. In 1840, a woman named Mary D. Dibble, age between 40 and 49 and very likely Jonathan's widow, was heading a household in Posey Township that contained a male child between the ages of 10 and 14, a female between the ages of 15 and 19, and two other women in their 20s. Mary's father was William M. Smith, a Revolutionary War colonel who was commissioned by the State of Massachusetts. Probably in 1843, Mary filed a claim with the federal government for any pensions still unpaid to her father. The matter was referred to the House Committee on Revolutionary Claims on January 29, 1844 on a motion by Congressman Thomas Smith of Rising Sun (we don't know if he was related). By 1850, Mary had moved north, to Rising Sun in Ohio County, where she was living with her daughter Ellen in the home of the shoemaker William Davis and his children Ellen B. Davis, age 8, and Samuel, age 6. Some of the children of John's (much) older brother Samuel also settled in Switzerland County. They included two sons named Ingersol or Ingersoll, a son George, and a daughter Harriett. Their stories will be told separately. By 1850 John's sons Silas, Henry J., Charles, George and John W. were heading up their own households. Silas Dibble married Mary Jane Bunnel or Bunnell on August 24, 1840 in Switzerland County, less than a month after his father died. Mary Jane was probably the daughter of Moses Bunnel and his wife Polly, and was born between 1820 and 1825. Moses died between 1840 and 1847. There were several other Bunnells in the county between 1840 and 1870. I thought when we plunged in and could see the water so rough and the rocks so close under us and channel so crooked, that it would be impossible to get down through that crooked, narrow chute without wrecking the boat. I watched Evans to see if he acted scared, but he only smiled when the boat was whirring around first one way and then another, like a top. Evans cried out, 'Go ahead on the labboard and go ahead on the stabboard.' Then, 'Easy on our side; go ahead on the other.' It seemed to me he just twisted the boat through that crooked channel where it seemed impossible for the boat to get through, but we made it and did not touch a rock. We could see the great black rocks in the bottom of the river as we pitched over them. When we got over, the Captain paid Evans off and put them all on shore on the Indiana side and they walked back to Jeffersonville to get another job." In those days, with medical knowledge primitive and doctors scarce in the rural landscape, many infants and young children did not survive. Then, too, some of those children, being born to mothers who were worn down by frequent childbirth, poor nutrition, and long hours of hard physical labor, emerged into the world in a weakened state. Sadly, two of the children of Silas and Mary Jane did not make it. Sara Emma Dibble died less than two years after she was born, on January 10, 1852. The infant Silas Howe Dibble passed away three months later, on April 21, 1852. Two of Silas's brothers married members of the venerable Searcy family. Since their arrival the eastern uplands of Posey Township had been dominated by the Searcys; the intersection of Searcy Ridge, Asherman Rd., and Boone Robinson Rd., a few miles northwest of Patriot, is known as "Searcy Crossroads". For more on those and later children, see Indiana Dibbles. Silas's brother Charles stayed on his father John's farm until he was around 25 years old, farming in the summer and running flatboats down the river in the winter. Justice of the Peace John J. Jack married Charles Dibble and Elizabeth M. Searcy on May 25, 1845 in Switzerland County. Charles and his wife had no children of their own. They took in and raised two foster children: Emeline Hays, who was born around 1848, and Daisy Lamkin, born around 1869. Charles bought his own 134-acre farm just above Egypt Bottom, the flat land in the curve of the Ohio River in the southeast corner of the county. He later expanded the farm by another 80 acres, but in 1869 he sold this farm, possibly to Charley Adams, and moved into the village of Patriot. Then he bought 187 acres in Hunter's Bottom, which would seem to be across the Ohio River in Kentucky, just southwest of Vevay, the Switzerland County seat. He also bought a 176 acre farm located at the foot of Shull Hill from Samuel Locke in 1875. Charles grew rye and buckwheat on his farms. He continued to live in Patriot though, and he worked on flatboats until 1880, when he gave it up "on account of age and decreasing profits." Relations were not always sweetness and light between Charles and his brother. In the fall of 1885 Charles foreclosed on a loan he had made to Silas and took him to court to collect $174.21. Charles dabbled in local Democratic Party politics, serving as a Patriot town councilman. He was one of the founders of the Patriot Baptist Church and served on its Building Committee. He was the treasurer of the Quercus Grove and Patriot Public School, and also treasurer of the Patriot & Bark Works Turn Pike Company, and worked on the construction of that road. And he was a member of the International Order of Odd Fellows. Charles' and Elizabeth's ward Daisy Lamkin married William Robert Vogt in 1899. Charles and Elizabeth acquired the house in Patriot that his brother Silas (and Silas' wife Mary Jane) had owned, and gave it to the young couple. Charles suffered through a long illness before he passed away on May 14, 1904. When Charles' father John died in 1840, his 160-acre farm was divided up among his children. It's not clear if most of those children made use of the land, but Charles' younger brother George was one who did. He stayed on the farm until the age of 16. Then he struck out on his own, as a blacksmith. He got tired of that after about two years though, and returned to farming. He also did some flat-boating. In 1843 George ended up in court. That was the year of the disputed Indiana State Senate race between David Henry and Daniel Kelso. Kelso was the incumbent Senator from Switzerland County and had previously served a term in the Indiana House of Representatives. David Henry was a land owner in the county but does not seem to have been a career politician. The election was held on August 7. However, a recent revision to the state's election law had sown some confusion among local officials as to who should receive, and certify, election results from the precints. On August 9, the election commissioners counted the votes and determined that David Henry had won. On that same day, Daniel Kelso filed a challenge against them. On August 24 the commissioners decided they didn't have jurisdiction over the dispute and refused to consider it. The State Senate Committee on Elections subsequently found that the board made that decision at Henry's instigation. Henry and Kelso both accused each other of having received illegal votes. Illegal voting does not seem to have been particularly out of the ordinary at that place and time. Men who were eligible to vote sometimes voted in the wrong precinct. And young men who weren't quite of legal age--21--also voted. (Women were not allowed to vote at all.) In this case the election was so close--Henry claimed to have won by just one vote--that the illegal votes mattered and had to be sorted out, if possible. Both candidates deposed dozens of witnesses and submitted affidavits to the Senate. Among them was that of George Dibble "Junior". Now, George's father was named John, but he seems to have started calling himself "Junior" to distinguish himself from his older cousin George, who also came to Indiana and whose father was John's brother Samuel. Twenty-one years of age on the 21st day of September, 1843, according to the entry in the family Bible, and information of my parents. Did you vote for Senator in Switzerland county at the last August election? and if so, in which township did you vote, and who did you vote for as Senator? I voted in Posey township in said county, and voted for Daniel Kelso for State Senator." The first point that comes to mind is that this could not be a verbatim transcript. Phrases like "information of my parents" and "in said county" are legalese and not the way Indiana country boys speak, then or now. Of course, the obvious second point is that George was, indeed, under age, and didn't seem particularly worried about it. Neither was Samuel Howard, who, "being of lawful age, and first being duly sworn, says, that some little time after the August election, ... he was in Craig's store, in the town of York, in the county of Switzerland, and that Daniel Kelso was there conversing about the number of votes recieved illegally for David Henry, when David Kelso, his own brother and warm supporter, replied--'You need not make any fuss about it, for you know, Dan, you received as many or more illegal votes than Henry.' He then proceeded to mention his stepson, John Cox, who he said was not twenty-one years of age, and that he voted for Daniel Kelso. Dan'l Kelso did not deny in any way what his brother David said in relation to the vote of the said John Cox. David Kelso then went on and said that Robert Sherdon had also voted for Daniel Kelso at said election, and that he was not twenty-one years old when he voted; and Daniel Kelso replied that he knew he was not of age when he voted for him (Daniel Kelso) for State Senator at said election. And the said Howard further says, that he was standing at the polls at the time the said John Cox, who afterwards voted at said election for Daniel Kelso, presented his vote in the town of York, and that his, the said Cox's, vote was challenged, and that he refused to swear to his age, and although there were many of said Cox's friends, who probably knew his age, standing by, no one would vouch for his age." At any rate, the numbers provided showed 917 votes for Kelso and 916 for Henry. The Senate Elections Committee found that the county election commissioners had not issued results according to the proper form. (The precinct judges had not sent returns to the commissioners, and the commissioners did not issue a written certificate.) The Committee "suppressed" all of the depositions regarding fraudulent votes except one, and they accepted evidence that a math error had given Kelso two more votes than he should have had. Subtracting 2 from Kelso gives Henry 916 and Kelso 915. The one fraudulent voter accepted as proved by the committee was for Henry; subtracting this made it a dead heat. Then the Committee found that the county provision in case of a tie (to let county officials decide the winner) was unconstitutional, and so they reported that no legal election had taken place in Switzerland County and neither Henry nor Kelso won. Presumably a new election would have had to be held, but history does not record who won and eventually became Switzerland County's Senator. For more on these and later children, see Indiana Dibbles. John Dibble's son John W. Dibble married Malinda Hizer on March 11, 1850 in Switzerland County, Justice of the Peace Bela Hearick officiating. 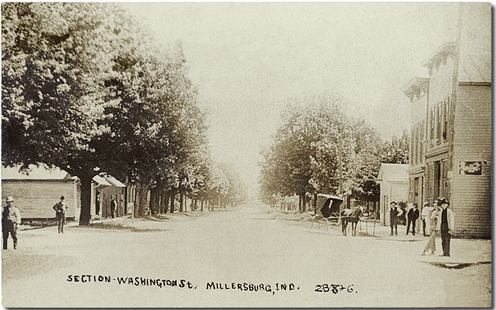 Malinda was born around 1832 and was probably from the Hizer family of Cotton Township. John probably remained on his share of his father John's farm, at least for a while. His mother Sarah, and his two little brothers, Jonathan and Sylvanus, were living with him and his bride in 1850. Malinda died of unknown causes in 1852. John married Lydia Bowman on July 19, 1853. This time it was a church wedding, officiated by a minister named William Dolly. Lydia's parents were probably David Bowman and Elizabeth Kelly, who were married in 1830. David died in 1837, and John and Lydia took in his widow and Lydia's sister Sarah after they were married. John served in the Civil War as a private in the 2nd. Battery, Indiana Light Artillery. Sylvanus also joined up when he came of age. You can read more about the war service of John and Sylvanus at Indiana Dibbles in the Civil War. John's sister, Sarah Elizabeth Dibble, married Jacob A. Powell on November 14, 1847 in Switzerland County. Bela Hearick officiated as Justice of the Peace. Jacob's parents were probably Jacob Abylott Powell and Elizabeth Howard. Jacob Abylott Powell was born on October 11, 1772 in England. He came to Maryland as a young man before 1791. There he married Elizabeth Howard, who was born on March 18, 1781 in Delaware. Jacob, Elizabeth and their oldest children moved west to Ohio, and Jacob may have moved back and forth between that state and Indiana, or perhaps he maintained farms in both states. His son Jacob A. Powell was born in Indiana on September 17, 1820, and in 1824 the elder Jacob purchased 80 acres of land some 30 miles away in Warren County, just northeast of Cincinnati. At least two of his older sons, William H. and William Osborn Powell, came to Indiana. William Osborn Powell married Elizabeth Grey, who was born in 1797 in Baltimore. One of their children was Cornelius R. Powell, born in 1826 in Posey Township. William H. Powell settled in Randolph Township in Ohio County. There, on September 24, 1835, he married Lucinda North. Lucinda's father, Levi North, was one of the founders of Millersburg and may have been related to the Norths who founded North's Landing. One of William and Lucinda's daughters married a Searcy. Jacob Abylott Powell died on April 17, 1846. His wife Elizabeth followed him on August 12, 1853. Both are buried in Antioch Cemetery in Posey Township. We'll have more on the Powells later. Jacob Powell the younger made his living as a produce merchant, probably in both wholesale and retail lines. The first child of Sarah Elizabeth Dibble and Jacob A. Powell was Mandana Powell, born in about 1849. The family moved back and forth between Ohio and Switzerland Counties. In 1850 one Nathan Powell, age 15, was living with them. Even with all the Powells around in the area, including a separate batch that came from Pennsylvania, we have not been able to find a credible family connection for Nathan. But this enterprising teenager, whoever he was, was already working as a clerk, perhaps in Jacob's business. For more on the family of Sarah Elizabeth and Jacob Powell, see Indiana Dibbles. John Dibble's son and Sarah's brother Alonzo reached adulthood around the time that Sarah got married. Little is known of his activities in Indiana. Perhaps he was the teenager living with John Dibble in Lancaster, Jefferson County in 1840. Jefferson County is just to the west of Switzerland County. This John was between 50 and 59 years old. We have no idea who he was. Well, we have an idea, but nothing to back it up but speculation. Perhaps Alonzo worked as a boatman, as so many men in the Ohio River bend did. However, when news of the gold strike at Sutter's Fort reached southeastern Indiana, Alonzo got gold fever, and he crossed the plains to California to strike it rich with the '49ers. He went straight to Dutch Creek in Eldorado County, the heart of the gold rush. This little creek joins the American River west of Sutter's Fort in Coloma, about ten miles north of Placerville. By the time Alonzo arrived there was probably already a crowd of eager prospectors placer mining along the creek. Gold can be found mixed with quartz in seams running underground. It is a "noble metal", which means it resists oxidation and doesn't combine easily with other elements. So when fast-moving water erodes a seam containing gold, the metal gets washed out in its almost pure form, in grains ranging from the size of dust particles to nuggets weighing an ounce or more. Gold is very heavy, so when water carrying gold slows down as it moves from spring to creek to river, the gold soon falls to the bottom, even the tiny particles. Sometimes the water slows down at a particular spot in a creek or river, owing to a sharp bend, large boulders in the bed, or a widening of the banks. At these points sand bars will form and large amounts of gold may settle out. Such a place was the junction of Dutch Creek and the American River. 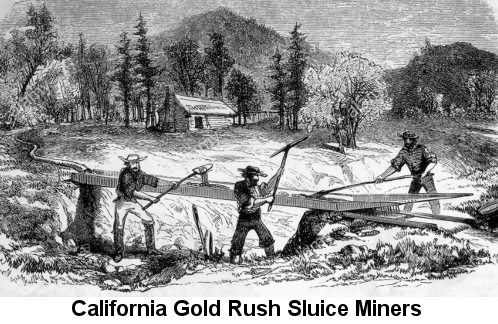 Placer mining is a form of open-pit mining that seeks to get gold out of riverbeds. The basic principle hasn't changed from the time of the '49ers, though the technology has improved. The miners at Dutch Creek would dig gold-bearing river mud ("pay dirt") up with their hands and dump it into shallow pans, which they would then shake back and forth in the river. The water would gradually wash the mud out of the pan, leaving the heavy gold to sink to the bottom. If a miner was lucky, he might find some big nuggets or a lot of powder this way. But it's not a very efficient way to process lots of pay dirt. So it wasn't long before the miners started using rocker boxes. 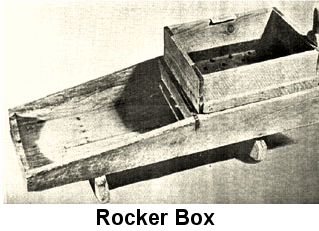 A rocker box is a wooden box that is open on the top and one end. There's a section in which to dump pay dirt, and another section containing "riffles", a corrugated surface like that of a washboard, and perhaps carpet. The box sits, like a cradle, on rockers. Dirt is dumped into the box, water is added, and the miner rocks the box from side to side. Slowly, the water washes the dirt over the riffles and carpet, and the heavy gold settles out. This enables coarse processing of a lot of dirt rather quickly. However, the riffles and carpet must be removed periodically and carefully rinsed, and the resulting sludge must then be panned to fully separate the gold. As time passed and the easy-to-get gold was taken, it became necessary to process much more dirt to get a reasonable amount of gold. This gave rise to sluices, which required a steady supply of running water and pay dirt. A steam powered pump could be used to provide water, or, if the creek was following a steep enough downward slope, a diversion channel could be dug to bring water from the creek through the sluice. The miners would haul pay dirt to the site, using wagons or little rail cars drawn by horses, and then rapidly shovel it into the sluice. This was a big operation. Companies were formed to carry it out, and many of them were named for sand bars in the American River, from which pay dirt was hauled. We don't know if Alonzo was panning or using a rocker box on his own, or working with partners in a company that built a sluice. There was a "Hoosier Bar Mining Company" in the area, so perhaps he had something to do with that. The miners lived in rough tents or shacks in a temporary camp. That's where an intrepid census enumerator found him on November 29, 1850. The enumerator crossed out the column header on his form that indicated whether the persons being counted had some sort of disability, and he wrote in "Average value of each miner's daily product." Next to Alonzo's name he wrote "$4.00". We don't know if that was a lot of money in that time and place or not. It's easy to guess that the people who sold supplies to the miners got as much as the market would bear. The usefulness of this "average" for Alonzo is diluted because the enumerator entered ditto marks under it for every other miner living along Dutch Creek. It's been presumed that Alonzo failed to strike it rich, but he might have made a decent living, at least for a while. In any case, he came back to Indiana after less than a year and a half, and went to work on the riverboats, running from Patriot to New Orleans and back, and visiting points between, such as Cairo, Illinois and Memphis, Tennessee. But even this regular travel did not sate his wanderlust. Stories of a healthful new land to the north, with great growth potential, had filtered down to the Ohio River valley. 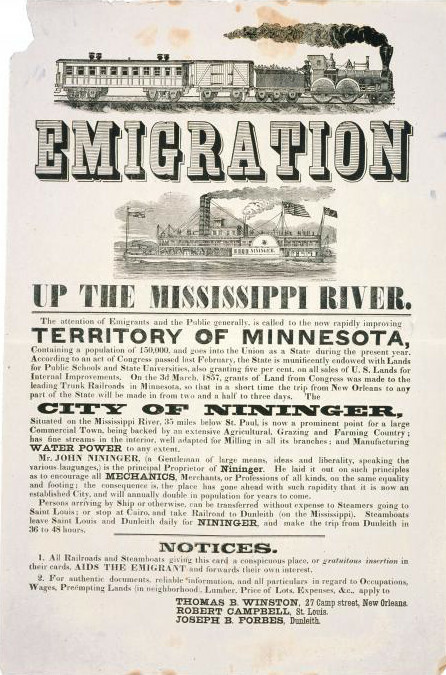 Just two or three years after returning from California, in late spring or early summer of 1854, Alonzo set out on a new trek, to southeastern Minnesota. With him went his young brother Jonathan, plucked up from John W.'s farm. We will follow them there next, but feel free to tarry here a while longer, and learn more about the numerous and prosperous Indiana Dibbles.